Tiny bike to the rescue! You may remember my tiny bike. Well, I haven’t ridden it much, for perhaps obvious reasons. I did ride it to work one day with a savage hangover (somehow I thought it might be a good idea, and felt a bit shaky to be clipped in), but other than that it’s mainly be sitting in the shed. However, this evening it came into it’s own, and, at least in my mind, justified its purchase. To understand this, you need to know that Mrs Chillikebab is eight months pregnant. And she needed an apple. NOW. And we didn’t have any. What to do? A trip to the shop was needed, and fast! Obviously riding there was the way to go. The fixie? Didn’t want to bother with silly shoes. The tourer? Still need silly shoes, and then the thought of panniers to carry everything and a lock seemed too much. The pug? Possibly a better choice, as it has flat pedals, but for various reasons it’s stuck at work. So the little bike it was! I wheeled it out from the back of the shed, put some air in the tyres (they had gone very soft – such neglect!) and off we went. And what fun! Pedalling along, sitting proudly upright, feeling the cooling evening breeze. The first stop was the grocery. Too late! It had shut. Woolies it would have to be. I pedalled along Darling Street on my little bike, getting admiring (I’m sure they were admiring) looks from the people eating in the pavement restaurants. Whizzed down the hill feeling the wind in my hair, with even a taxi overtaking me on a blind bend not spoiling my mood. Prop the bike up on it’s kick stand outside the shop, Into Woolies, buy the precious apple (Granny Smith. 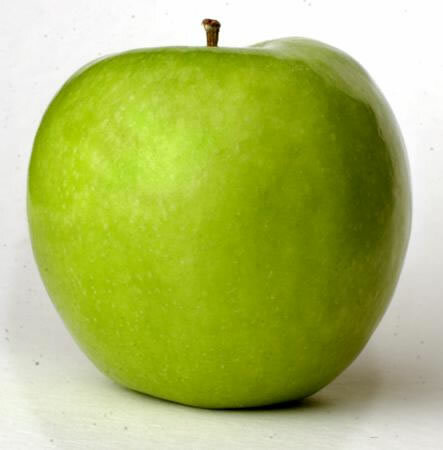 It has to be a Granny Smith! ), and then back on the little bike and pedalling home.